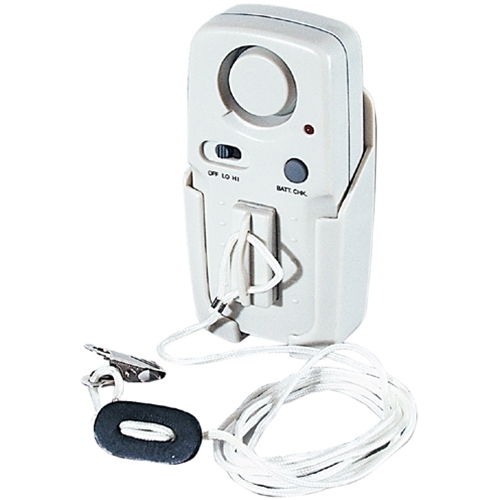 Drive Medical Tamper Proof Magnetic Pull Cord Patient Alarm from HealthyKin.com uses a pull-switch, which includes a convenient On/Off switch, that activates from any direction and adapts to various situations with a cord that adjusts from 28" to 58". The unit mounts easily on a bed or wheelchair — even on a patient's clothes thanks to an alligator clip. Volume adjusts from 85 to 95 dB on the alarm, which requires one 9V battery. The product has a 1 year limited warranty. Cord Adjusts from 28" to 58"